Behold: my breakfast from now till Christmas! These are such a lovely start to the morning. Warm and comfort food-ey and delicious even without any butter on them. I’m afraid this is another one of my scrawled-on-a-piece-of-paper recipes so I’m not sure where I originally got it, but I’ve been making them forever. These freeze wonderfully! I freeze them flat on a cookie sheet then drop them in a zip top bag; I take out one every night and it’s thawed by morning when the coffee is ready. You can also pop it in the microwave for a couple seconds to warm it up. Quick and easy comfort food! Edited to add 11/12/10: Ooh I just found something! For a decadent version of these involving cream cheese check out these from Family Bites! These look great! I just got stuck on one part, though. You instructed me to take out ONE muffin each night to thaw. I’ve never eaten ONE muffin in my life. Please advise. You make an excellent point. Perhaps I should amend this to “one ________ out each night” and you can fill in the blank. Muffin? Dozen? Bag? Metric ton? Talk about customization. 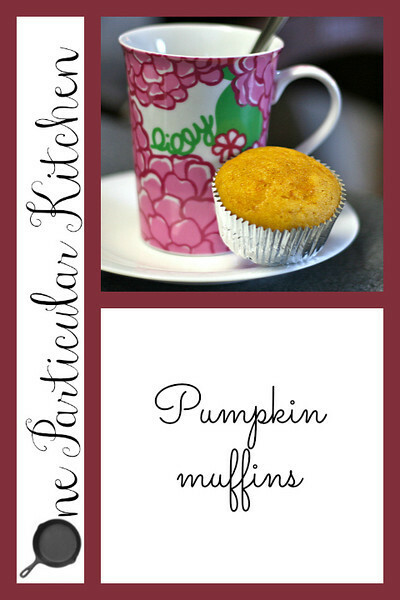 i love pumpkin *anything* + look forward to giving these a try. on an unrelated note, i love the mug in the picture — too cute! If you wanted to un-health these up a bit, chocolate chips are a surprisingly tasty addition to baked pumpkin treats. Hi Erin, do you have any red wine vinegar mother? I need a little mother to get the vinegar going. I am sure there is someone in Nashville that has made or continues to make vinegar, I just need to find them. Are you one of them? Hi Erin, thanks for looking out for my vinegar mother! Once I make vinegar, I plan on share the product as well as the mother if cooks and foodies want some. *sigh* this is what I should have done yesterday instead of making pumpkin cupcakes with an orange cake mix that was a wee past its prime. Next weekend!